Today is the beginning of another new challenge at Tag You're It! 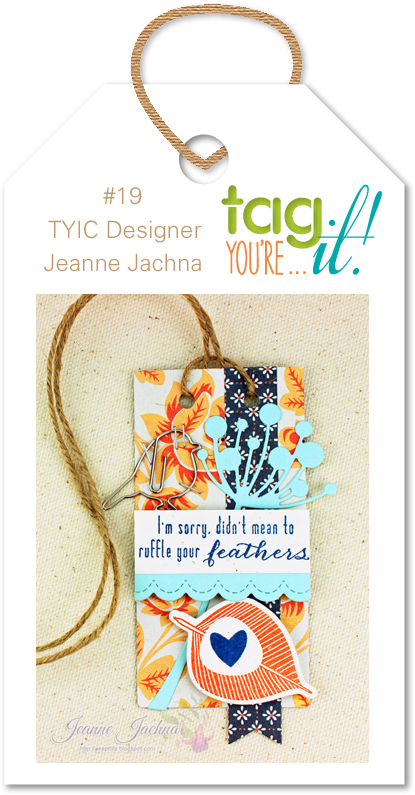 This challenge we have inspiration from Tag You're It Designer Jeanne Jachna. Our inspiration is from a tag that Jeanne previously created. I was inspired by the colours of Jeanne's tag and that she used one of my favourite Basic Grey paper collections of all time. Any excuse too pull it out and play with it again. I used one of the solids as the background on my tag, another solid as the flower shape and then die cute the petals using four different patterns from the collection. A lot of patterns yet with the right balance of white space to make me happy. Love, love, love those patterned papers. This is fabulous Tracey. So gorgeous! LOVING that flower!! CUTE tag! I love it! Love this tag, Tracey. The sentiment is fab and what a gorgeous flower you created with those papers. This is fantastic! Love the different petal patterns! Great tag! Fabulous tag Tracey!! The BG paper gives the flower a modern feel! I'm a mixing papers kind of gal, Tracey, and you've done it beautifully. This gorgeous tag popped out at me via flickr! I LOVE it. OOOOH... very clever way to get all those pretty patterns all in one place! Eye candy Tracey! Your tag is beautiful! I love the way you used the same paper line and tied all the patterns into your flower! Your sentiment is gorgeous too! Gorgeous way to use those papers Tracey - I can see why they're one of your favourites...those Autumnal colours look fabulous together! This is one beautiful tag...and I love that sentiment. love the flower with the button.. such a pretty tag.. This is fantastic. I love that paper, too, and the way you used it for the flower is so brilliant--just a small dose has a big punch. I need to remember to play this month, because I love Jeanne's inspiration tag as well. What else can I say but: love, love and love! Your flower, with its pretty petals, makes me happy! Fabulous tag--love how you kept a CAS look and still used all those gorgeous papers! Love your choice of papers for your bloom, Tracey! 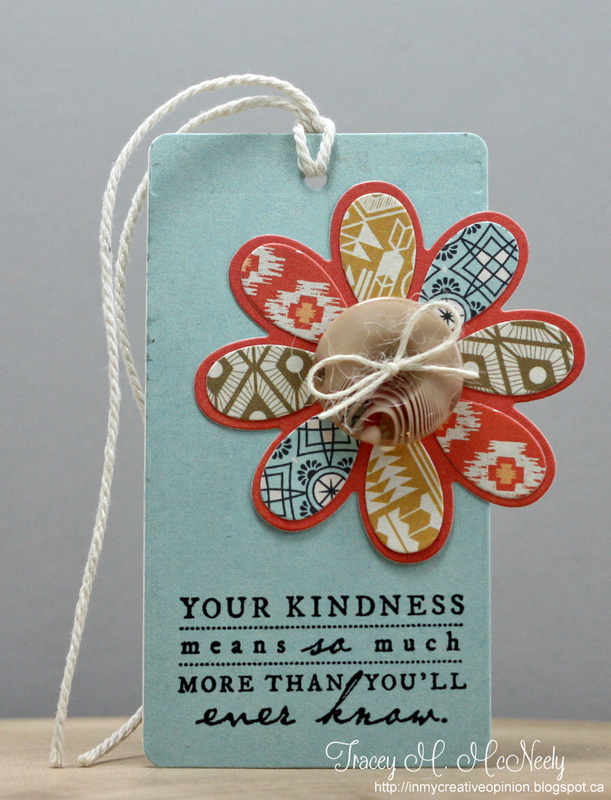 Such a pretty tag and lovely sentiment! Love this tag!! Almost has a retro ish look to it. So pretty! I love this set you used for your take on Jeanne’s tag, so pretty! Great take on the tag! I just love that persimmon line and love all your petals! What a fabulous use of that collection! I had so much trouble with it, but it may just be Basic Grey in general for me. So pretty! Happy Friday and Tag You're It Reminder!